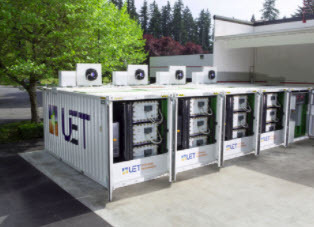 “I feel very confident batteries are going to be our solution,” CENSE president Don Marsh told the Bellevue Reporter in August, shortly after PSE announced the final route for the Energize Eastside transmission line. PSE vice president Andy Wappler disagreed, saying a battery big enough to defer the power lines would be enormous – too big for PSE to properly charge between peak events. Mr. Wappler based his statement on a 2015 report by a PSE-hired consultant. The report has many flaws and shaky conclusions. For example, the consultant determined a 328-megawatt battery would be needed to cover a 14-megawatt need. No battery in the world has been super-sized so dramatically. PSE has been dragging its feet on batteries because transmission lines are much more profitable for the company. CENSE has asked the UTC to consider a rate-of-return policy that would align PSE’s profit goals with the public’s desire for safe, sensible, sustainable energy solutions. Customers can save money and PSE can get a higher return on its investments. This is the kind of win-win scenario that the Pacific Northwest deserves. CENSE will cover this and other major developments at an event for Eastside residents. Join us to celebrate recent accomplishments and prepare for the challenges ahead!